Hello, my lovelies! How is everyone's week progressing so far? Personally, it's been a long one... and we're only halfway through! I've been feeling quite overwhelmed with a lot of facets of life lately, but that's a conversation for a different time. What's really frustrating me right now is the fact that I'm already fighting my first sore throat of the season, as is little miss, which tells me that we probably picked up some germs when I brought her to play group last week. Yup, we've made it to ONE play group so far this school year, and already someone is sharing germs. This is why I rarely ever took wee man to these sorts of things. Kindergym, play group, etc... every time I'd take him he/we would get sick! AGH! And with my bestie on her way over this weekend for a long-overdue visit, I cannot afford for any of us to be sick! So here I am, with a giant cup of tea with honey, little miss with some of her own, trying to rest up, but still be somewhat productive. 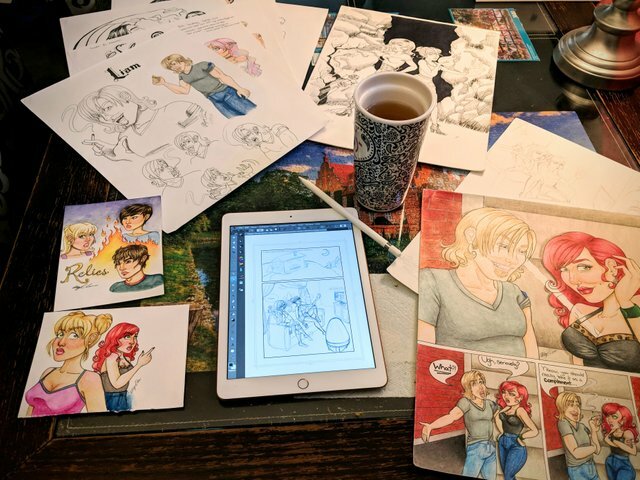 And so, I figured, since I'm sitting and sipping on this tea, it might be a great time to show you all a bit of my comic book progress so far. Some of you may have seen my post a few days ago about my birthday, where I bragged about my awesome husband gifting me a new iPad and Apple Pencil. Well, I've been busy tinkering away with that, playing with the Procreate app a little, and trying to get accustomed to things. 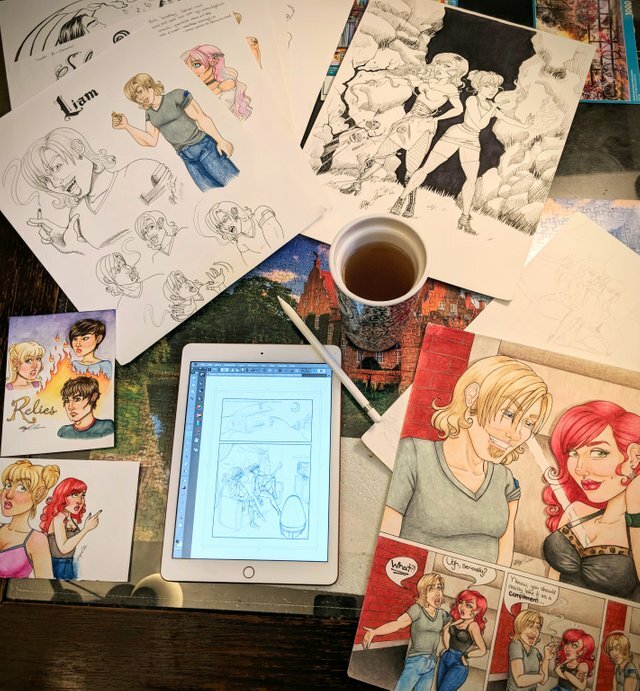 Fast forward a couple days, and I come across the latest comic book update from @bryan-imhoff (one of my favorite comic geeks here on Steemit), where he mentions that he's been using an iPad app, Clip Studio, in the production of his own comic book, and so I had to check it out! I've played around with it a little, and with a variety of pre-made comic page templates, as well as the ability to customize as you'd like, I can definitely see how it could aid me in getting the layout right. 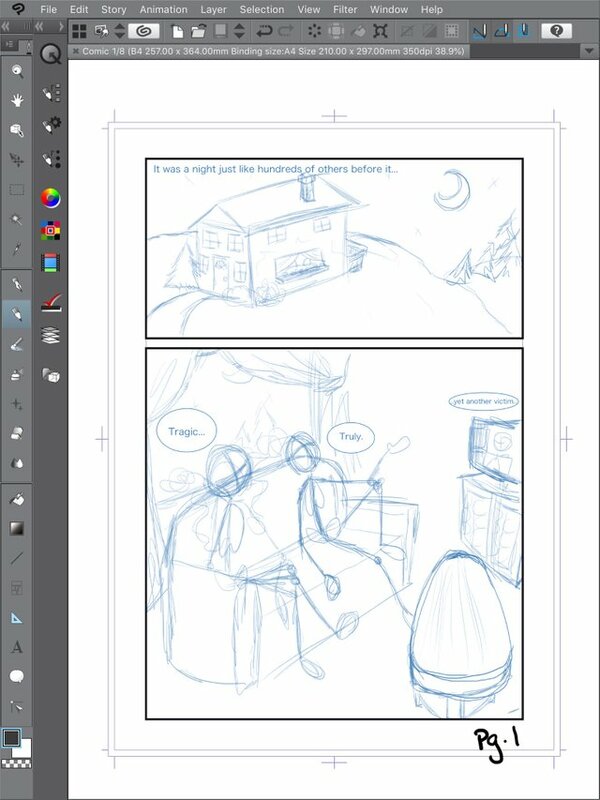 So, I've done a bit of sketching on the first page of my comic, I've been playing around with drawing on multiple layers, refining as I go, but after tinkering for a while, I feel like I'm probably going to use the app to do my roughed-out panels, to figure out my layout, and do the story boarding. A pile of character studies, some dramatic comic book ink, a couple quick watercolor studies, and a couple paneled pages: reference and inspiration. As I get more comfortable with drawing digitally I may change my mind, and I'll continue to play around with everything, as I've got a ways to go before anything "final" is produced. I've still got about 3-6 character studies left to do, as well as cementing the exact story (which will probably happen as I'm doing the storyboard - I tend to work with whatever creative whim hits me), but I've got nearly enough together to start working on the first handful of pages, so stay tuned for further updates on all of that! Well, I've finished my tea, and the chores aren't going to do themselves, so that's all from me today! I hope I can come back and actually upvote this, later when Steemit settles into it's own after this hardfork? But, it looks like you are plugging along and getting there. I am still toying with a comic idea for my Winter project but can't seem to quite decide how, what, or IF I should give it a go. I'll wait and feel it out. This post is such a delight to my eyes. I really appreciate the amount of work that you poured into your comic creation. Look at all those lovely hand painted drawing <3. It is apparent to me how much you care about your characters, and I wonder if you are having a great time drawing with your iPad Pro? I am also thinking to buy myself one hahaha. Maybe when I have saved enough money.